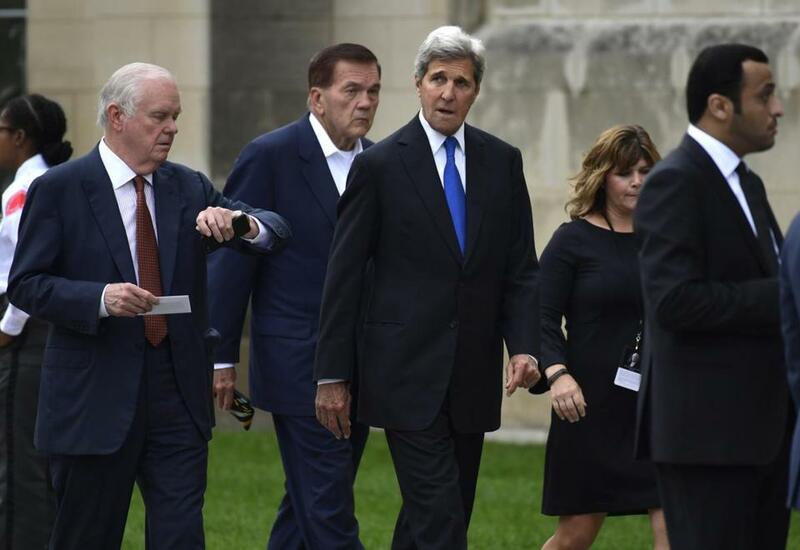 Former Secretary of State John Kerry, center, arrived to attend a memorial service for Senator John McCain at the Washington National Cathedral on Saturday. WASHINGTON — Former Secretary of State John Kerry isn’t shutting the door to a second presidential bid, more than a decade after his narrow loss to President George W. Bush in 2004. In an interview with CBS News, Kerry, who represented Massachusetts in the Senate for 28 years and was secretary of state during President Barack Obama’s second term, declined to say ‘‘no’’ when asked whether he might run for the White House in 2020. Rather than speculate on his presidential prospects, Kerry said he’s planning to hit the campaign trail for other Democrats ahead of the November midterm elections. ‘‘I think that’s the most important work we can do right now, is trying to elect people on a national basis and restore the leadership that the country needs,’’ Kerry told ‘‘Face the Nation’’ host Margaret Brennan on Sunday. In 2004, Bush won with 286 electoral votes to Kerry’s 252. The popular-vote margin between the candidates was slim — only about 3 million votes, or three percentage points, separated the two — and many Democrats lamented that Kerry would have taken the White House had he not narrowly lost the key swing state of Ohio. After his loss, Kerry returned to the Senate and later took a pass on running for president in 2008. In announcing his decision at the time, he acknowledged that he ‘‘came close, certainly close enough to try again,’’ but he ultimately viewed the Senate as the place where he could be most effective in opposing the Bush administration’s foreign policy, particularly on the war in Iraq. If Kerry were to jump into the 2020 Democratic fray, he would have plenty of company. More than two dozen potential candidates are testing the presidential waters, including former vice president Joe Biden, Senators Kamala Harris of California and Elizabeth Warren of Massachusetts, Starbucks executive chairman Howard Schultz, and Michael Avenatti, the lawyer representing adult-film actress Stormy Daniels in her case against President Trump. Working against Kerry is the fact Democratic primary voters have been supporting women and minorities over white men at unprecedented rates this year. Many among the new crop of Democrats are also calling for generational change at the top of the party, a trend that could have repercussions in the race for the 2020 White House nomination. Kerry will be 76 by Election Day 2020. Sunday was not the first time Kerry has mentioned a possible bid. In January, an Israeli newspaper reported he had told Palestinian officials he was considering a second White House run. News of Kerry’s remarks Sunday prompted some observers to voice skepticism about his chances, with a few sharing tongue-in-cheek suggestions that other unsuccessful White House hopefuls should join the race, as well. Others highlighted the assets that Kerry would bring to the race. Mary Anne Marsh, a Democratic strategist who previously worked on Kerry’s campaigns and as a member of his Senate staff, said that although it’s too soon to speculate about 2020 presidential prospects, ‘‘there’s an advantage to having gone through the process once’’ and come close to winning. Like the late senators Edward Kennedy, Democrat of Massachusetts, and John McCain, Republican of Arizon, Marsh said, Kerry returned to the Senate after losing the White House and played a key role in shaping US policy before going on to serve as secretary of state. And although the elections from 2008 to 2018 have underscored the Democratic Party’s diversity and inclusivity, that shouldn’t preclude certain candidates jumping in the race, she said. The CBS interview also brought to the fore some of the underlying tensions between Trump and Kerry on foreign policy. The two sparred earlier this year over Trump’s dismantling of the Iran nuclear deal, with the president accusing Kerry on Twitter of ‘‘shadow diplomacy’’ following reports the former secretary of state had held behind-the-scenes meetings and phone calls with key players. ‘‘I didn’t negotiate; I spoke out, and I will always exercise my right to speak out,’’ Kerry said in defending his conversations. He took aim at Trump for what he said were ‘‘dishonest tweets’’ in which the president claimed Kerry had never threatened to walk away from the table in his negotiations with Iran.